The Unité Paludisme (paludisme is the name for malaria in the French language) at Moissala, a small town in the south of Chad was established by Médecins Sans Frontières in 2010 in order to respond to the annual increase in malaria that habitually occurs following the arrival of the rainy season in late May. The unit is open each year from June to December and accepts children aged from 0 to 59 months, the age group particularly vulnerable to severe malaria. With the coming of the rains in late May or early June every furrow or depression in the ground either in the forests or the fields becomes a still pool of water in which the mosquito is able to complete the aquatic stage of its life cycle and thereby proliferate in enormous numbers. The cause of malaria, a disease that kills an estimated 850,000 people in the tropical world each year, is a parasite that depends on the mosquito for its transmission to man. 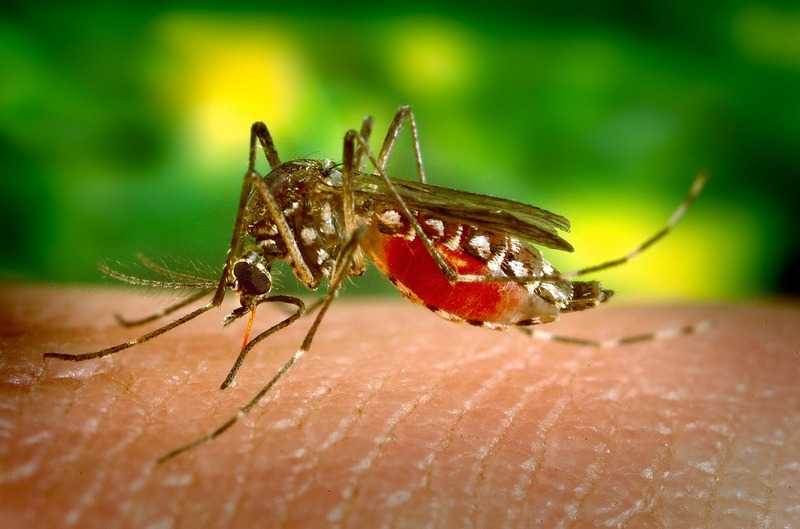 When the mosquito bites, it bites in order feed and the female mosquito requires the protein present in blood to develop her eggs. She locates the person on whom she is going to feed by means of her capacity to detect the CO2 (carbon dioxide) that they have exhaled, the heat emanating from their body and the various chemicals that are the base of our bodies’ odors. Having located a warm area of skin that indicates to the mosquito that the blood-containing capillaries are near the surface, the mosquito’s sophisticated proboscis consisting of two tubes pierces the surface of the skin and enters the deeper structures rich in capillaries. Through one of the two tubes that make up the proboscis, the mosquito injects saliva that contains a substance that numbs the skin and an anticoagulant that guarantees the fluidity of the blood that it then aspirates through the other tube directly into its stomach. If the mosquito has taken blood from a person infected by the malaria parasite, the parasite will be sucked into the stomach, where, following a further period of development it will locate itself in the salivary glands from where it will be injected with the saliva into the capillaries of the next person that it bites, so spreading the disease with great efficiency. All the children that we care for at the Unité Paludisme will have been located and bitten by the mosquito in the manner described above, their delicate and richly vascular skin making them ideal targets. Once injected by the mosquito, the malarial parasite rapidly locates the liver, an organ rich in nutrients that enables it to develop into the next phase of its life cycle. Following this period of nourishment and development, the parasite is transformed into a structure that when released into the blood stream rapidly locates and destroys the red blood cells that carry the oxygen to all parts of our bodies. Furthermore, it creates on the surface of the red cell hook like formations that cause the red cells to clump together in a manner that can provoke an obstruction in the small blood vessels of the brain or other vital organs. The Unité Paludisme was created in order to treat young children suffering from the most severe forms of malaria that without rapid and efficient treatment carries a near 100% mortality. The child arriving at our unit will be suffering from the toxic effect of the malaria parasite, often with a high fever of 40° or more. They will be suffering from a severe anaemia due to the destruction of the red blood cells, and have a blood count frequently as low as a quarter of the normal. Many children will be convulsing or in coma as a result of the direct effect of a massive parasite infestation on their brain plus the lack of oxygen provoked by the severe anaemia and the obstruction by the clumped red cells of the small vessels to this vital organ. As the parasite has effectively taken for its own use all the nutrients from the liver, the level of glucose in the child’s body will be low, sometimes undetectably so. Victim of the toxic effects of the malaria parasite, with a blood count so low that it is impossible to transport oxygen effectively to the cells of the brain and other vital organs, with a glucose level so inadequate the cells of the body are almost totally deprived of their fuel, one understands the reason why the children who arrive at our unit are so desperately ill.
At the Unité Paludisme, we are a team of five doctors with a full equip of nurses with pharmaceutical and administrative support. Our unit opened on 5 June, but from mid-May we had been working together on the latest treatments, procedures and techniques to deal with this, the most serious form of malaria. Since the opening of the unit we all meet together each morning at 7:30 am in order to discuss the events of the previous 24 hours. The documents accumulated by Médecins Sans Frontières during the many years are a unique source of information, and as well as this we draw upon all the information available from other sources, including the experience of each one of us. This is a lively and stimulating period of the day. For the most part our young patients arrive by motorcycle from their home village, a service provided by Médecins Sans Frontières. There are no made up roads in this part of Chad, and the beaten earth roads and tracks that can be difficult even for our 4x4 vehicles during the daytime, become formidably difficult at night or during the heavy rains. A journey of a few kilometres may take several hours to accomplish, and for some children already desperately ill, this is too much and they die on route. Once the child has arrived at our unit they are evaluated with extreme rapidity. For many children we give oxygen upon entry enabling their impoverished red blood cells to transport oxygen more efficiently. The blood glucose is immediately assessed and, if necessary, rapidly corrected by injecting glucose intravenously, at the same time the level of hemoglobin is measured and a blood transfusion organised for the severely anaemic child whose organs cannot withstand this level of anaemia. At the same moment we set about destroying the malaria parasite that is circulating in the blood in order to prevent further damage. To do this we inject, after having first used the rapid test for the diagnosis of malaria, a drug based on a plant known to the Chinese for over 1,500 years. The drug that we use with great efficacy in our unit is Artesunate that we inject intravenously and which rapidly reduces the circulating parasite load, by a factor of 10,000. Furthermore it inhibits the parasite in its various stages of development in the body and also helps to prevent the hooking together and clumping of the red cells. Artesunate is derived from the “quinghao” or “doux bois de vers”. It remains active in the body for relatively few minutes and is remarkably non-toxic, so much so that we are happy to give it to babies from their earliest days. For the severe forms of malaria it has been shown by clinical trials to be superior to all other forms of treatment. From their entry to our service all our children are perfused intravenously. Some of course, following several days of febrile illness are dehydrated, sometimes severely so, others are too weak to eat or drink. As perfusion fluids we use a mixture of Ringer Lactate and glucose. Ringer lactate is another “oldie”. Over the past century many solutions for intravenous perfusion have come and gone, but none has been shown to be superior to this solution. Sidney Ringer (1835-1910) an English physician formulated the solution that bears his name well before the end of the 19th century! Without any doubt, the Unité Paludisme of Médecins Sans Frontières at Moissala must be considered a centre of reference for the treatment of young children with malaria in its most severe forms. The statistics for France Metropolitan, for all age groups, show a figure of between 100 and 200 cases of severe malaria each year. With admission rates that can rise to well over twenty each day we rapidly achieve the figures for France and Europe in relatively few days. It is not uncommon for us to have between 50 and 60 patients under our care at any one time, but we have space to increase this capacity should the need arise. The value of this unit is certainly recognised by the Chadian government. Since our opening in June, we have been visited by the President of the Republic of Chad, Idriss Déby as well as the head of the regional government. Following their admission, and until their condition is stabilised, our young patients are treated in our intensive care unit. As their condition improves, and they recover some of their strength and start to eat, they are transferred to our post-intensive care unit where they complete the first part of their convalescence under close supervision. By the end of five to seven days most of our little patients have happy smiling faces, are eating well and are ready to return home to their families. It is most gratifying.